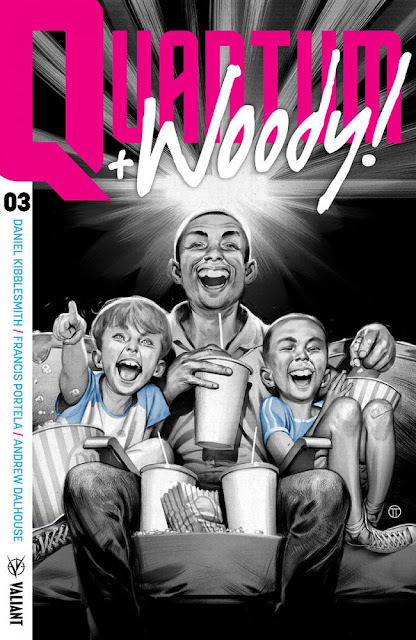 Valiant's superhero action comedy, 'Quantum and Woody,' is usually wacky fun and while the fun remains Daniel Kibblesmith and Francis Portela inject some pathos along the way in issue three. If you've read 'Quantum and Woody' at all for any amount of time you know things can get a little strange. Derek Henderson, the father the boys lost, had a backup of his consciousness transferred to a goat. Just bear with me for a moment. So they kept the goat around as a family pet until their arch nemesis created an energy anomaly that somehow caused the goat to go into labor. Are you with me so far? The resulting "birth" returned a copy of their father to them temporarily. This is what happened next. Kibblesmith uses flashbacks in the series to delve deeper into what made Eric and Woody the way they are or in Woody's case just how little they've grown up. Nonetheless, the two couldn't be more different. It's what makes this series fun. The earnest heroics of Eric as Quantum and Woody's reckless personality play up the buddy comedy of opposites that is both familiar and entertaining. Here, the flashbacks show tender moments with their dad and alternate with present day of the copy spending time with the boys before he's fated to die. Knowing this Eric is desperate to find another vessel to move his father's consciousness to before that happens. Meanwhile, Woody is trying to make his final moments fun and exciting. Woody's tender side comes out and the issue enters some emotional ground that feels unexpected and all the more heartfelt for it. With such talented artists like Portela and colorist Andrew Dalhouse in charge of the visual storytelling, the pacing, the layouts, and transitions are perfectly laid out and look fantastic. Because Woody and Eric's personalities are so different they have to be portrayed uniquely with everything from facial expressions to body language and there's no question that they deliver in full. The script tells the story while the art sells the story. 'Quantum and Woody' #3 shows the versatility of the creative team proving they can do more than sight gags and comedy but can also find an emotional depth when needed. They add some more dimensions to the worst heroes ever that show them to be more than just cartoon characters. Kibblesmith finds the right balance to tickle your funny bone while grabbing your heart. It continues to be one of Valiant's most beloved titles and with good reason.